PerioRub gel offers fast, effective, long-lasting relief from tooth and gum discomfort. Vegitarian formula contains soothing organic and responsibly wildcrafted herbs plus essential oils. Works to calm and soothe gum distress. Also freshens breath while promoting healthy gum tissue. Helps promote cell vitality. Dentist formulated with Co-Q10 and Folic Acid. Preservative free. Refreshing cool mint flavor. Use as often as needed. Gently massage gel into the gums and pockets around teeth with a cotton swab. Use as often as needed. If discomfort persists for more than 7 days or worsens, or gums become irritated, red or sore, discontinue use and contact your dental professional or physician. For children 2-6 years of age, use a small amount and supervise until good habits are established. Children under 2 years of age, consult your dental professional or physician. Purified Water, Vegetable glycerin, Phytoplenolin, Bio-Chelated Extracts of echinacea purpurea tops, calendula flower, olive leaf, black walnut (green hulls), gotu kola herb, chamomile flowers, blood root, green tea leaf, prickly ash bark, grapefruit seed; Essential Oils of peppermint, oregano, clove, thyme,lavender, cinnamon, and eucalyptus, Bio-Saponin , folic acid, coenzyme q10, aloe vera phytogel , sodiumbicarbonate, hydroxyethylcellulose, xanthan gum, and chlorophyll. 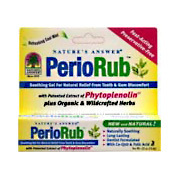 PerioRub Topical Rub is shipped in a discrete, unmarked package. Orders are processed immediately and usually take about 3 to 5 working days to be received. We do ask that you try it for 2 to 3 weeks to feel the full effects. Any information received is used only for order processing and shipping purposes. Your information, such as e-mail address, will never be disclosed to a third party.